Ovill McKenzie claimed the vacant Commonwealth light-heavyweight title with a brutal 15 second knockout over Jeff Evans at the North Bridge Leisure Centre in Halifax on Friday night. Referee Terry O'Connor took one look at the stricken Evans who lay sprawled on his back over the bottom rope, his head on the ring apron waved the fight over. McKenzie 31, from Derby was coming off two hard scraps against Tony Bellew for the British and Commonwealth belt. The Jamaican born fighter is renowned for his punch power and proved it against Bellew in their first when he had the Bomber down and almost out, but Bellew got up to win the fight by KO in round 8. There was no doubt when they met for a second time however with Bellew outboxing McKenzie for 12 rounds and maybe a rubber match between the pair cannot be ruled out. McKenzie first shot to prominence when he won the Prizefighter trophy at cruiserweight, but as a light-heavyweight is where he looks the most effective and he is a dangerous foe for anyone with his concussive punching power. McKenzie now as a record of 19 wins and 11 defeats with 8 stoppages. 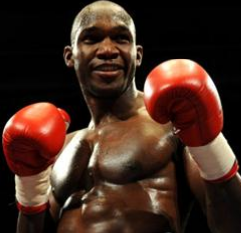 'The Upsetter' turned professional in March 2003 and now seems to be getting better with age after an up and down career. McKenzie always looks in great shape and on this latest showing he will be a test for anyone at light-heavyweight domestically.